After just one month of announcing the three a-JAYS (model One, Two, and Three), the company's new dynamic transducer based entry level models, JAYS brings us the three t-JAYS (also One, Two and Three) - and very surprisingly, are also dynamic transducer based. While all three t-JAYS will have one 10mm dynamic transducer in each side, the t-JAYS One will have a standard version of the transducer and the least amount of accessories, t-JAYS Two will have a custom tuned transducer with more accessories, and t-JAYS will have a special TCD transducer in semi-opened configuration (*vented port) with the most accessories. You can expect these to hit the market in May. No info on price yet, but a reasonable guess is they will be another level (or two) up from the a-JAYS. 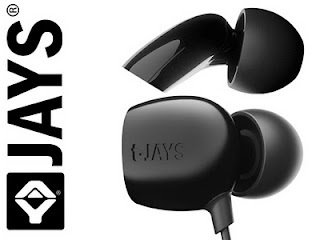 Possible price are $110 for t-JAYS One, $125 for Two and around $140 for Three. [UPDATE] The confirmed price are around $80, $90 and $100 for the three t-JAYS.